*Paraphrasing Why I Write by George Orwell in 1946. Making books is not an exact science. There are several factors determining whether a publishing venture will have a happy ending. First you need a topic that appears timely and interesting, then you need a potential audience for the publication. After this, there is the question of the material and human resources needed for its completion. In the case of books for bi(tri)ennials, most of the factors mentioned above are already in place: courtesy of the curator you certainly have a topic, you also have several audiences ranging from the visitors to the event to people interested in the topic and, gaining weight more recently, you have the audiences conjured up by the PR offices taking care of exhibitors’ communication strategy. There is also the question of funding, which in most of the case relies on public sector cultural agencies or private companies that support culture.1 And there is also the institutions’ interest in seeing a tangible outcome from their participation in events that are both cultural tours de force and dynamic agents for new research, because biennials have demonstrated that disciplinary knowledge is no longer produced only within academia.2 Following the agenda of placing the host city/region on the map of contemporary cultural production, the events themselves trigger site-specific knowledge and open up new research topics related to contexts that would otherwise not be possible to come out solely from the walls of Academia. As we can see, the inexact science of making books has all the ingredients for success in the case of books for biennials. So why are they so rarely referred to during and after those events? How is it possible that after years of research, countless nights of editing, and printing rushes, not to mention distribution adventures, there is relatively little reverberation from the material produced and printed as a book? In ‘The Biennale Syndrome’, Carolyn-Christov Bakargiev notes that the accelerated growth of biennial events since the early 1990s parallels the rise of the Internet. With respect to architecture, the biennials are becoming the ultimate vehicle of communication at a time when communication is the ultimate objective of consumer culture.3 To the interest in documenting the exhibited installation or pavilion, we must add the visitors’ selfies testifying to their attendance at the event. Paired with this selfie culture, or maybe fueled by it, there is the increase in performative actions accompanying installations. Performativity then seems like the right strategy to attract attention at a time of excessive communication. If performance and immediacy are the contemporary methods for communicating knowledge, it is not strange that books go largely unnoticed, except for the brief raising of a toast to celebrate their launch. For instance, in the recent Bed-In conversations, Beatriz Colomina, professor and architectural historian, explored the role of the bed in the architecture of the digital age, and the rise of new ways of working in relation to the bed and sleeping habits of young professionals working in different parts of the world. Responding to the theme WORK, BODY, LEISURE posed by the Dutch Pavilion at the Venice Architecture Biennale 2018, curated by Marina Otero Verzier, Colomina re-enacted the performance by Yoko Ono and John Lennon in the big white bed of room 902 at the Amsterdam Hilton in 1969. Afterward, Colomina’s bed-in performance was also hosted by the Serpentine Gallery for the Work Marathon event. Both the topic and the format had been previously addressed by Andreas Rumpfhuber4 and Gonzalo Herrero Delicado5 respectively. But the combination of being performed by a reputable academic at a prestigious event and then broadcast in real-time via social media and online magazines, has given Colomina’s re-enactment far more resonance than its predecessors. The performative effect is so strong that even people who didn’t visit the Biennale have internalized the images of the Bed-In at the Dutch Pavilion, as in the case of cartoonist Klaus (@klaustoon) who included the Bed-In re-enactment in two of his most recent cartoons. While we are yet to know the contents of the Bed-in conversations, we are fed the images of reputable critics in pyjamas. Here we have the setup, but the content is still missing. Or is the medium itself the only message? Will performance “kill the critical-thinking star”? How much does your tote bag weigh, Mr. Biennial Visitor? Another stand-alone example is the book Island,14 which accompanied the British Pavilion’s exhibition of the same name at the Venice Architecture Biennale 2018. Edited by the exhibition’s curators, Caruso St John and artist Marcus Taylor, the book is a wonderful compendium of literature, poetry, and music, revolving around the curators’ exploration of the island as a place of refuge and exile. Navigating its pages, the reader finds poems by poet and musician Kate Tempest along with texts by William Shakespeare, in a provocative confrontation of narratives. For the recent 4th Istanbul Design Biennial, A School of Schools,16 the curatorial team of Jan Boelen, Nadine Botha and Vera Sacchetti, presented their curatorial motivations, inspirations, and research in the form of a reader.17 A very handy book, light in weight but heavy on ideas, which instead of presenting the exhibited projects, includes some guest contributions in different and complementary formats, including visual essays, provocations, critical essays and interviews. The contents challenge the bureaucratization of design education and explore the instrumental uses of creativity for the production of culture. Giovanna Borasi shared her concerns about what a biennial book is and how it complements the exhibitions, when she wrote: “Is a biennale-book on, about, of or for architecture? This question challenges what an architecture exhibition [book] is for, what its content and the modality adopted to construct its public are, as well as, ultimately, what its scope is.”20 In his essay Why I Write, George Orwell states that “putting aside the need to earn a living, I think there are four great motives for writing, at any rate for writing prose”. These four motives are sheer egoism, aesthetic enthusiasm, historical impulse, and political purpose. Time has passed since 1946 when this essay was first published, but it seems that his four reasons for writing can still be applied to almost every biennial book: the sheer egoism of the curator’s desire to seem clever, to be talked about, to be remembered after the end of the event; the aesthetic enthusiasm to make an outstanding contribution and find original ways to communicate the event’s narrative, and possibly win an award; the historical impulse to seize the spirit of the moment, the essence of the pavilion theme, or to lay the foundations for the next buzz topic on the architectural scene; and the political purpose to steer the focus of the discipline discourse in a certain direction, promoting the agenda of the patron, be that an academic, government or corporate institution. But are these enough reasons to keep publishing biennial books? At a time when, as we have seen, the performative effect is the stronger output of biennials and similar events, what price the plethora of printed matter that it seems nobody reads, or at least few admits to reading, that ends up as just one more item on your bookshelf? Is it worth it? 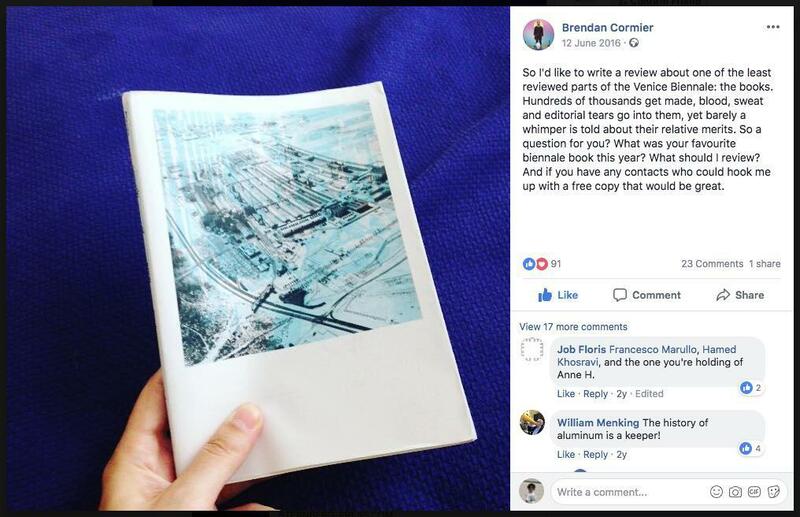 We argue that it’s worth keeping on making biennial books and that we have to face a challenge on two fronts: a challenge for the curators, editors, and cultural agents who produce the books; and a challenge for all of us, bookmakers and the readers who collect them, arguably not just as souvenirs. We’re also responsible for their biennial-afterlife. Here is our proposal: to start building an open database of books from all architecture and design biennials, something similar to ASAC Dati.21 But truly functional, and open to receive and allow consultation of collections in electronic format from all established biennials and those to come. Let every event, festival, promoter, curator, and attendee preserve their physical volumes but allow electronic copies to act as the means of future preservation and consultation. The biennial will end, the performances hopefully preserved as YouTube videos, the plans and models returned to the architects’ studios or packed in boxes until a curator asks for them again, online magazines and blogs will have evaporated once sponsorship is gone, PR offices will be busy promoting the next hype. But the book, containing all the intellectual effort, will be able to be read years after the event. It will bring a sense of the cultural, social and political concerns of those years and will be discovered and possibly read by people who didn’t expect to witness a seminal part of such events, and their impact on the evolution of architectural discourse.